Flood is ravaging Benue State and victims need all the help they can get. The State government has appealed to the Federal Government and Nigerians for assistance and aid is gradually flowing in. 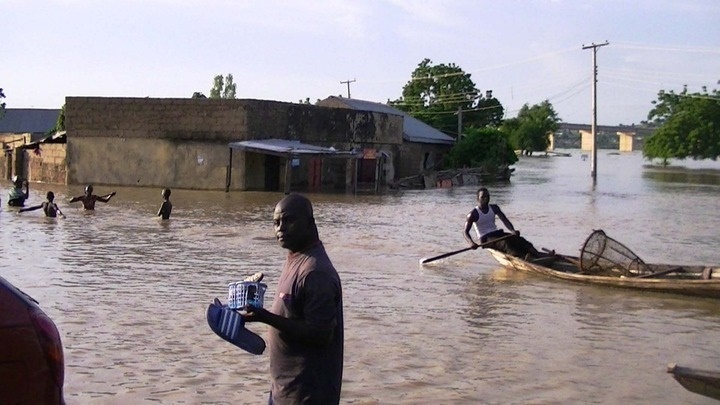 On Monday, the Nigerian Air Force (NAF) said it had inaugurated a medical assistance programme to meet the medical needs of flood victims in Makurdi, the capital city. The spokesman for NAF Headquarters, Air Commodore Olatokunbo Adesanya, announced the assistance in a statement in Abuja. It is part of the Command’s corporate social responsibility and was borne of the desire to contribute to the medical needs of the flood victims. After he received the news, Governor Samuel Ortom of Benue State thanked NAF for its assistance, especially in area of humanitarian services in Nigeria. “Thousands of victims of the flood were accommodated at the Makurdi International Market, where NAF medical outpost programme was inaugurated,” he quoted Governor Ortom as saying. The NAF had earlier transported the Director General of the National Emergency Management Agency (NEMA), and other officials to Makurdi in response to a Presidential directive. To make the medical assistance successful, the Chief of Air Staff, (CAS), Air Marshal Sadique Abubakar, has directed the Medical Services Branch of NAF to provide more drugs and deploy more medical personnel to complement the efforts of the command.